Born in Germany, raised in Kenya, South Africa, Hamburg, and northeast Ohio, Jann Klose is a musician that brings a well travelled sound to his music. Klose is a singer/songwriter with a voice that seems to comfortably reflect while he paints demonstrative art with his music. Nothing proves this more than the song “Still” from Mosaic. When I heard this song for the first time, I felt like I had found a long lost friend. It’s really just a simple vocal/acoustic guitar number, but Klose delivers the “real” like few others can. His genuine, organic vocal tone and playing style stroll hand in hand. The real and natural sound he generates really does steal the big chair in your family room and makes itself at home. “Still” is probably the softest and most tender track on the album, but it differs quite a bit from the other offerings Klose brings to this disc. The disc opens with “Make It Better,” and it’s a song with a galloping energy that is fueled by a staccato guitar riff and some solid organ work. The steady rhythm section is also a tight unit throughout this entire set, and well worthy of note. The next track is where things start to really flourish vocally for Klose. “Know What’s Right” is another steady rhythm track where he let’s his voice take flight a little bit. The vocals are layered for great harmony, with the lead never straying too far out from the song. Klose has great control of his strength; and as we see with the following track, “On And On,” he has great control with his range as well. Klose goes into a natural high voice that becomes yet another friend to the listener. As far as the varying influences you might hear, they might range from John Lennon to Dave Matthews to Counting Crows, with a little of The Police and Matthew Sweet thrown in for good measure. You might even feel like he starts to channel some of the great blues guitarists on “Falling Tears,” or even the reggae greats with songs like “Four Leaf Clover” or “Make It Better.” But again, it’s the natural comfort that Klose exhibits with his songs that really makes them shine. He never sounds like he’s forcing any of these different styles. Perhaps much of the success of this album can be attributed to the fact that Klose surrounds himself with some of the best musicians and technicians in the industry. Mosaic is produced by Grammy winner James Frazee (Blondie, My Morning Jacket), and David Bendeth (Paramore, Bruce Hornsby, Elvis Presley). Not to mention that two-time Grammy winner Warren Russell-Smith mastered Mosaic. As far as musicians, we get accomplished guitarist Florian Opahle (Ian Anderson, Greg Lake), oboist Megan Marolf (Phillip Glass, Roger Waters), and a host of other talented contributors. 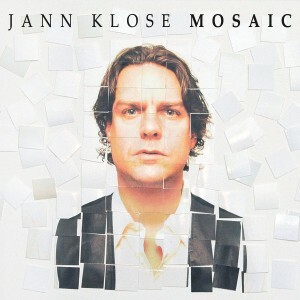 When it comes to singer/songwriters of today, Jann Klose could be the best there is. He has a versatility like I’ve never seen in the genre. He goes from style to style with a natural comfort and sensibility, and I’m more than happy to concede the big chair to a talent like this.